24.7 mm of rain received with river level relative low and clarity very clear for the month. As such trapping has been slow however cormorant activity has increased notably and added presence of numerous pelicans. Frosts are still being experienced, (-7°C) and water temps still to a minimum of 2°C with usual winter varied weather conditions. A flood event has occurred on the 31st Aug, with rain water and snow melt run off inundating trap barrier. Jindabyne Central School year 9 agriculture student attended the site for an orientation and view hatchery production as part of an aquaculture program. They will return later in the season to see varying development in ova and fry. A small sample of each species (1+) was provided to Fisheries Officers to transport for aquaria display at the Melbourne fishing, camping and boat expo. Brown trout Trapping continued and data obtained from further brown trout. A total of 1111 have been trapped. Due to the slow nature of trapping this season and inability to have large quantity of adults to supply bulk green ova the proposed additional ova for Dutton hatchery is likely to be supplied as eyed ova later in the season. As a consequence additional brown trout ova have been laid down at Jindabyne. 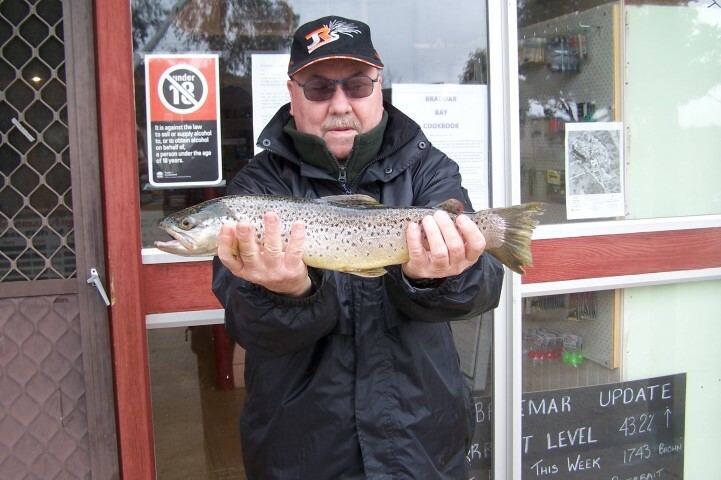 Eildon trout Farm Victoria has expressed interest in purchasing 3000 brown trout eyed ova however documentation to enable translocation is yet to be received. 542,500 ova laid down at Gaden 280,000 green ova sent to Dutton Rainbow trout Few (29) rainbow trout have been trapped and data collected to date. Surplus (220) to future production will be marked by research staff and have been released into the Thredbo River and Lake Jindabyne. August saw a solid month of tours through the hatchery and plenty of people using the picnic area. The clear water coming into the hatchery ponds from the Thredbo River, along with the hatching room being in full swing gave tourists a great insight into all facets of fish production here at Gaden. Peter at Braemar here with a fishing report for the week ending August 28th 2016. Well once again it was a mixed week weather wise and fishing results reflected that, snow and wind sent everyone packing as conditions were very ordinary indeed, prior to the snow conditions were more favourable and some nice fish were caught once again, Max Gengalacki caught a nice Brown on powerbait and Daryl Suckley managed 3 nice fish with one Brown going 1566 gms, Ben Tickle led the fly-fishing brigade and encountered a few smallish rainbows taking slow drifted nymphs but generally action was poor on the fly front. Colin Nicholson from Geelong did well on his only trolling outing with 7 Rainbows taking a # 56 and # 37 Tassie, all of Colin’s action happened around the dam wall end of Halstrom Island in fine calm conditions, Alistair and Greg Dunham from Sale had a completely different catch rate with their first outing drawing an absolute bank in fine sunny conditions, however when the wind swung around to the south west the next morning they had a fantastic 2 hour session catching 16 fish, a mix of Browns and Rainbows from 600 gms up to 2200 gms, all caught around the tree line at the entrance to the Tolbar, their trolling depth was around the 3m mark, deeper or shallower brought no result at all, their best Tassie’s were # 13 # 48 and # 122. Charlie Rogers and Daniel Watson lure cast one fine sunny morning before the wind got up around the power lines and caught a nice Brown each on Pegron Blue, Charlie missed a monster Brown that was on for 10 minutes before breaking free at the knot, this fish was cruising the edges around the dirty stirred up sections and attacked the Pegron in only 20cm of water as the retrieve finished, Charlie was switched on enough to realize he had to let the fish run and opened his bail arm straight away allowing the fish to take around 20m of line and then the struggle to get him back to shore began, the estimated size of that fish is around the 4 kg mark. It is not uncommon for Browns to behave in this manner, particularly at this time of year, lures being retrieved back through the discoloured water tends to excite fish as they assume it is small yabbies being dislodged from their burrows, a distinctive orange coloured clay bank is the perfect place to cast lures once the wind has got up and quite often the fish will take the lure right at the bank, so be prepared to play the fish with only a meter of 2 of line out, don’t panic, open the bail arm and allow the line to spread through your fingers with a little bit of pressure on the fish and then play the fish once you have a few meters of line out, its a very effective way to play fish caught close in and don’t be surprised if you see fish chasing the lures right up tot he bank. The action around Eucumbene will steadily improve over the coming weeks, traditionally, windier days will bring better results especially for those who are lure casting along the banks, trolling will also improve but safety should be the first option, the more seasoned anglers have a good idea on what the wind can bring but everyone needs to be aware that conditions will change rapidly so keep that in mind when out and about boating. Pictured is Max Gengalacki with his 1100 gms Brown. Hit Jindabyne with the kids on Sunday and after a battle with the wind we landed a 42cm Salmon and a 40cm Brown. Both were caught on a dark coloured yellow winged Tassie on lead line down around the 6 m mark near the caravan park. We then pulled the boat out and fished with bait at Waste Point. After giving my 5 year old daughter Matilda instructions on what to do if the bells went off I went to move the car. On looking out the window I saw her winding the rod, thinking to myself she was doing what most 5 year olds do as they are so inpatient, only to see a splash next to the bank as she landed a 48cm Rainbow. Wasn't dad and daughter proud. Chunky Cheese being the bait. Cheers Dax Linden Canberra.